"Our first winter in Alaska I was impressed with the snow, the designs in it, the marks on it and, in a sense, what it would say to you if you really looked and listened. A few years later I celebrated the New Year by writing The Snow Speaks in the little cabin where I did most of my writing. It was very cold (-45 degrees), with sparkling stars and Northern Lights." 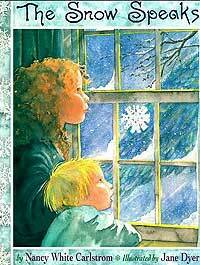 Captures the sights and sounds of the season's first snowfall, leading up to the coming of Christmas.